The UMBC campus serves as a living laboratory of sustainable practices by integrating academia, student life and campus operations, by researching new solutions through campus innovations. Learn more about future sustainability and conservation efforts in the campus campus master plan. UMBC has been playing an active role in protecting our treasured Chesapeake Bay through the stewardship of the watershed. In order to reduce polluted storm water run off from gushing into fragile streams, new initiatives have begun soaking in: from rain gardens, storm water retention ponds, pervious pavers, and even rooftop gardens and rainwater harvesting system our integrated irrigation and landscape features help water to infiltrate into the ground and replenish our clean underground water table and aquifer, and protect our local waterways from erosion and sedimentation. Like all of our new construction, the Patapsco Residence Hall’s new addition is designed to meet LEED* certification. 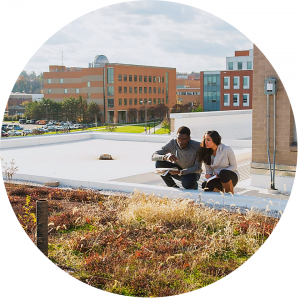 When UMBC opened up the process to the community, and incorporated a graduate student’s proposal for a ‘green roof’, a vegetated rooftop to research the impact on hydrology, or the flow of water through the landscape. In addition to being highly energy efficient, the green roof feature integrates research, education and sustainable living. Since that time, UMBC has added two additional green roofs to our facilities. The Residential Life Community Center was completed with a green roof in 2013. And the Administration Building Green Roof was completed in Fall 2015 with generous support from the France-Merrick Foundation. * The LEED rating system was developed by the U.S. Green Building Council (USGBC) in 2000 and provides verification that a building was designed and built using aspects of efficient environmental health conservation strategies. Certifications of Silver, Gold, and Platinum recognizes varying levels of design and performance in areas including sustainable site development, water savings, energy efficiency, materials selection, and indoor environmental quality. 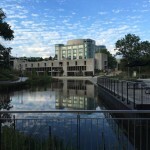 The new Performing Arts and Humanities Building is designed and built to meet LEED Standards in energy efficiency and environmentally friendly features. For instance, on the roof top you can find a rainwater harvesting system that irrigates the surrounding landscape. The university’s Performing Arts and Humanities Building has been awarded a LEED Silver designation. Its sustainable features include a rainwater harvesting system (for on-site irrigation), use of pervious concrete sidewalks and a white roof which will reduce the building’s urban heat island effect. From the center of campus by the Commons Breezeway to new parking lots, we have begun implementing an innovative new technology: pervious pavers. Rather than the asphalt of the past, a new solution allows polluted run off to replenish the groundwater rather than puddling up or gushing right into overburdened and eroding streams. Did you know UMBC researchers helped develop pervious pavement? Features including rain gardens, retention ponds and expanded vegetated cover from No Mow Zones and protected tree cover also help to filter and absorb water and protect the Bay. 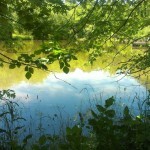 Both Pig Pen Pond and the Library Pond serve as stormwater retention areas! The Conservation and Environmental Research Area (CERA) is a 50 acre protected natural area on campus established in 1997 thanks to the efforts of Dr. Eugene ‘Sandy’ Parker, Chair of the Geography & Environmental Systems(GES) Department. When plans to expand the campus through the development of a research park arose, the campus carefully set aside space to remain forested in response to concerns on the environmental impacts of the development, raised in the Landscape Stewardship Committee. 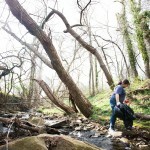 The committee was established at the request of faculty, who along with students, played a major role in advocating for the environment as a priority. CERA is used every semester as a living lab for professors and students alike. There are at least 9 courses including Science 100, GES 220, and GES 286 all go to CERA as a part of their class. In SCI 100 over 700 students annually study the science of water. GES 220 students learn field techniques and use their new skills to develop their own projects. GES 286 introduces students to the world of satellite imagery and GPS technology. UMBC students are given the unique opportunity and support to conduct independent student research as well as faculty research in the campus itself. 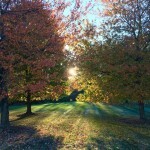 The park has been described as one of Baltimore’s most contemplative and tranquil art experiences. 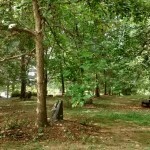 Founded in 2000 by the UMBC Center for Art, Design and Visual Culture with Sacred Nature, the public park features a bucolic arrangement of 30 trees and boulders. The installation, one of Baltimore rare examples of large-scale “land art,” is at once beautiful and thought provoking, a celebration of the power of nature—and art—to inspire and heal.The Joseph Beuys Tree Partnership was inspired by German visual artist Joseph Beuys’ (1921-1986) extensive 7000 Oaks tree planting project. Joseph Beuys used an image of an oak tree on a postcard announcing his original project in 1982, and wrote below the tree: “An Idea Takes Root.” By involving many community members, ideas will take root, and people will get themselves in motion to plant more trees and improve their communities in other creative and self-determined ways. As part of the Tree Partnership, over two hundred trees were planted among Patterson Park, Carroll Park, and Wyman Dell Park, all within Baltimore City. 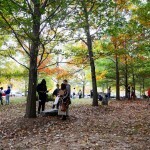 Thirty trees and stones were placed at UMBC’s sacred space, and each year the ensuing growth of each tree adds to the significance of the site. Patricia La Noue, a long time member of the UMBC Community and former Director of Interdisciplinary Studies spearheaded the efforts to establish the Greenway along with volunteers, students, and supportive partners. Her interdisplinary course allowed students hands on experience with designing many aspects of the Greenway. 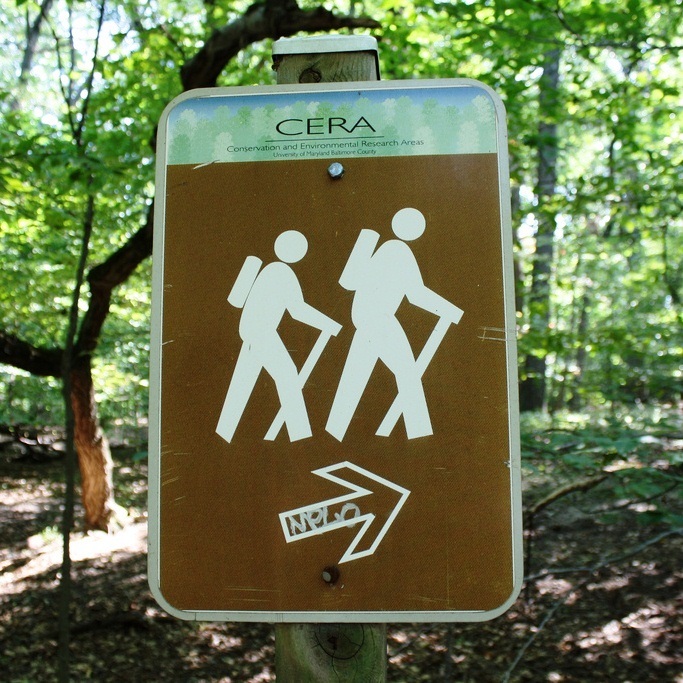 The greenway connects UMBC campus’s key green spaces such as the Joesph Beuys Sculpture Garden the Conservation and Environmental Research Areas, CERA. 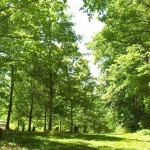 UMBC’s Tree Canopy: Check out the Herbert Run Tree Identification Page: by Ecotope. 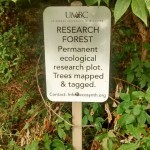 There are over 3,000 trees in inventory at UMBC, 300 of them planted since 2011. The 2008-09 UMBC Prove It! Campaign, a UMBC Student Government Association (SGA) initiative, provided $50,000 for a new Green Space, located near the entrance of the Center for Art, Design and Visual Culture at the Fine Arts building and Lot 16 – a highly traveled area of campus. With the help of her peers and faculty, Elani Odeyale ’09 led the Green Space initiative through the planning and construction phases.Green Space: Prove it!